Radhika turned around. There stood a lanky youth in a smart blue T-shirt and jeans. She frantically ran a search through the database lodged inside her skull. But no records were found matching this handsome young face. The young man seemed to read the blank expression on her face. "I am Vamsi from your IIT classes, back in 2003. Don't you remember? I was in touch with you on Facebook even till last year." She knew Vamsi. Yes. But this was not how she had imagined he would look like. Looks can be deceptive, especially on Facebook. She had hardly noticed him during her IIT entrance classes. So she had no memories of how he had looked then. When he had contacted her on Facebook three years back, she had imagined him to a dull, nerdy fellow from the hinterlands - not worthy of a Hyderabad girl's attention. But how could she have known then that he would turn out like this? She was glad she had never openly expressed her opinion of him. "How can anyone forget the wiz kid of the Ramiah classes? ", she lied. Vamsi had been a quiet introvert hardly known in the classes till the exam results came out. Even when the results came, it was only known that a certain Vamsi from the classes had made it to the top 100 ranks. Not too many could put a face to the name. But then who cared about these unpleasant truths from the past! She had been smitten by the first look of this young man and she wanted to know him better. "So what are you doing in Chicago?" "I work at Goldman Sachs, New York. I had come down to Chicago to meet a client on Friday. Thought I would stay the weekend and see the city. " "You are alone?" she enquired, running her dainty fingers over her smooth silky hair. "Yup. Not like I have a beautiful local babe to show me around, do I? What about you? You stay here?" "Yes. I have been here for the past 3 years on an onsite assignment from Infosys. Tell me! Maybe not a Western girl. But how about a hot Indian babe who knows the locale well?" she said giving him a tantalizing smile and a flash of her eye lids that had driven thousands of guys crazy. Vamsi nodded carelessly. "Indian babe, eh? Come on. Where will I get one of those out here? You mean you have a good looking friend who is a part time tourist guide? Well, I wouldn't mind." That was a direct snub. But then that had upped the odds for her. She had played this game many times before. But for the first time, she was not the one being hunted, but the huntress. That made it all the more thrilling. She had had only disdain for the desperate young men who had vied for her attention. She had assumed Vamsi to be one of them when he had got in touch with her on facebook few years back. But now she was discovering that he was altogether a different animal. Radhika discovered that the winds of the windy city were blowing her way. Her hopes ascended as they went up the Sears tower. 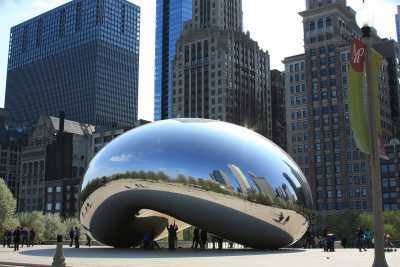 She knew she had made the catch of the millennia by the time they reached Millennium Park. Vamsi was apparently the same stuff dreams were made of. He was the perfect man for her in every sense. A BTech from IIT, a MBA from IIM, and most importantly a 7 figure salary. Well read, handsome and smart. And the most wonderful thing was the way their interests matched with respect to hobbies, books, movies, choice of food. Moreover, he seemed to have an uncanny ability to read her mind and literally take words out of her mouth. He was just too good to be true. She continued to keep in touch with him even after he returned to New York. They began to talk to each other almost on a daily basis and the gifts he sent her every week! It was as if he was fishing out gift ideas from the recesses of her heart. What a contrast from those stupid chocolates, trinkets and the greeting cards he used to send her from India 3-4 years back! She wondered whether he was really the same person. The phone call got cut before he could answer. She tried calling him. But his number was not reachable. For the next one week the number did not seem reachable. She decided to land up in New York and give him a surprise. The next day she took a day off and made her way to New York. "Just a minute, madam. He will join you presently", said the blonde receptionist politely. "Yes, madam. What can I do for you? "A short, thin bespectacled man in pin stripe coat stood before her. "Well, I came to see Mr. Vamsi Reddy." "I am Vamsi Bodapatti and as far as I know I am the only Vamsi in this office." "I think I came to the wrong place. Sorry for the trouble." She was puzzled. How could this be? Had he been deceiving her about his identity? But why? It did not seem to make any sense. The Goldman Sachs trial having gone cold, the only link left was the mobile number that continued to remain dead. She made a call to the mobile company to check about the number. "No, madam. The number you mention has not been in use for the past 3 years. It was temporarily assigned to one Mr. Vamsi while he was here. It was disconnected when he returned to India" She remembered Vamsi's trip to US 3 years back. That was before his MBA and he had tried calling her. She had had no time for him then. Now time was useless without him. She returned disappointed to Chicago. But she could not carry on with her life. Vamsi's memories continued to haunt her. She could not concentrate on her work. His face kept coming before her eyes. He had created a special space for himself in heart that nothing else could fill. The days turned into weeks and still there was no news of Vamsi. She thought longingly of all those days they had spent together. And all those lovely gifts her had given her - that red evening dress, that necklace with that exquisite stones, the native American earrings. She still treasured those gifts. She kept them safely in a special drawer in her cupboard. She longed to relive those memories those gifts contained. She opened the cupboard and pulled out that special drawer. She could not believe the sight that greeted her! Gone! They were all gone! Every one of the gifts. Disappeared without a trace. How could that be? It all seemed uncanny. The office had no records of him. The mobile phone had gone dead. The gifts had disappeared. It was almost as if Vamsi had completely wiped out all his trials. She pondered if there was any other link she could trace back to him. Then it stuck her - "IIT, Madras where he had got admission after the coaching classes.". She was going back to India for the Christmas Holidays. It would be a good time to look up these places. She called up IIT, Madras. "Yes. He was a student with us. He got placed with Polaris from campus. We don't keep any records beyond that." She remembered Polaris. He had been contacting her on Facebook while her was there. That was the company which had sent him to US 3 years back as well. She called up the company. "No, madam. We don't reveal details of past employees." "But this is an emergency. I am a family member and we need this information urgently." It took a lot of effort to convince the HR of the company to share his whereabouts. "He worked here for 4 years. After that he left to pursue his MBA at IIM, Ahmedabad." So far the story tied in with whatever he had told her. She looked up the IIM, Ahmedabad website to see the list of alumni from the 2010 batch. That was when he should have passed out. But there was no Vamsi on the list. She once again glanced though the list. She still could not find Vamsi. But she noticed another familiar name - Phani. He too had been with them in the coaching classes back in Hyderabad. He would know Vamsi well. She looked up Phani's details and gave him a call and introduced herself. "Hi, Radhika. Of course I remember you. How are you doing?" He seemed somewhat distant and formal without being rude as such. She wondered why it would be so. Wouldn't someone be glad to be connect with an old acquaintance? After exchanging a few niceties, she broached the topic of Vamsi. The moment she mentioned the name, the other end of the phone became silent. "Are you there, Phani? You remember Vamsi, don't you? He was with us in the coaching classes. He then went to IIT and then he must have been your batch mate at IIM as well." The phone went dead. She called again. "Why did you cut the phone, Phani. I was asking about Vamsi." "What is there to speak about Vamsi. Haven't you disturbed him enough in his lifetime without digging him up from his grave as well? He was agonizing about you all the time he was alive. Wish you had said one kind word to him when he was still alive?" Grave? Kind word while he was still alive? What was Phani saying? "I don't understand what you are saying." "Don't tell me you didn't know of Vamsi's death in a road accident a year and a half back." Again an awesome one ! Great read. Thanks a lot, Asha. Glad you liked all my stories. Good to see you on blog after a long time.